Promotion Schedule for Promotions for SGTs as SA for SAs as GHM has been announced by Telangana Govt . School Education Dept of Telangana has ordered District Educational Officers of 10 old Districts were ordered by School Education Dept of Telangana to prepare Category wise post wise seniority list for Promotions accordingly. TS Teachers Transfers Schedule GO will be issued shortly through Education Department of Telangana State. And this Government order will be placed in goir.telangana.gov.in. Official Website. 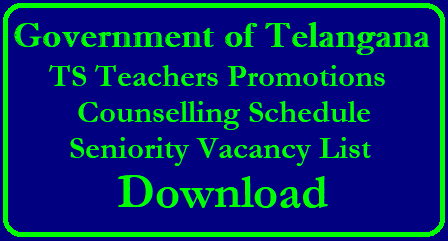 Most awaiting moments for Teachers in Telangana to get promoted to higher cadre as per seniority list and posted in better place as per vacancy list in Govt and Local Body Schools. Promotion Counselling Schedule will be released by DEOs of Concern District. Seniority and Vacancy Lists will be Displayed at counselling Centre. Telangana State School Education Department has issued the Schedule for Conducting the Teachers Transfers and Promotions in all Districts of Telangana State. Certain Guidelines have been given on TS Teachers Transfers and Promotions Counselling. This schedule for Teachers Transfers and Promotions has got approval.Promotions and Transfers are finalised on the long standing service is 5Years for PGHMs and 8 Years for others. Today that is 24-05-2018 a GO has been issued lifting ban on transfers and next other G.Os and Notifications have to be issued. Officials prepared a Schedule to complete the process with in a month. Secondary Grade Teachers School Assistants of various subjects vizz Telugu Hindi English Mathematics Physical Science Bio Science Social Studies are eligible to get promotions. As per the district seniority list District Educational Officer will conduct the Promotion Counselling. Officials invite objections on the list, After display of Subject wise senority list for Promotions .Just before of Promotion schedule Final Seniority list will be displayed . As per available vacancies, through the seniority list officials conduct counselling to the willing aspirants.